Margaret was appointed as an alternate director of MG Corporation in May 2017. Margaret is currently the Chair of the Yoorrooyang Dawang Regional Park Council. 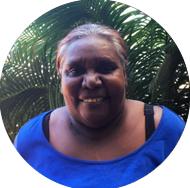 She is also currently a director of Kununurra Waringarri Aboriginal Corporation. Margaret has a detailed understanding of the policy context within which MG Corporation operates and is looking forward to contributing to MG Corporation’s mission of building a strong economic and social base for MG people that protects and enhances MG culture and heritage.